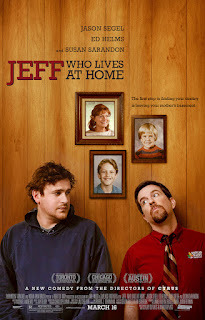 Synopsis: Jeff (Segel) is a slacker who lives in his mother's basement. One day he receives a wrong-numbers phone call for someone named Kevin that he takes as a sign. When his mother (Sarandon) sends him on a simple errand, he ends up following his "sign" instead and runs into his brother, Pat (Helms). Together they try to figure out if Jeff's destiny truly does lie with "Kevin" and whether or not Pat's wife (Greer) is cheating on him. Andrew: Hello readers! Tonight the wife and I decided that we would face the treacherous Friday night middle school/high school crowd to see a movie at the theatres. But we felt comfortable enough that we wouldn't have to deal with a crowded theatre because tonight we saw Jeff, Who Lives at Home, which is decidedly NOT a big movie like The Hunger Games or Mirror Mirror. No, we wanted to see Jeff, Who Lives at Home for basically one and only one reason. Sarah, would you like to explain to our readers what that reason was? 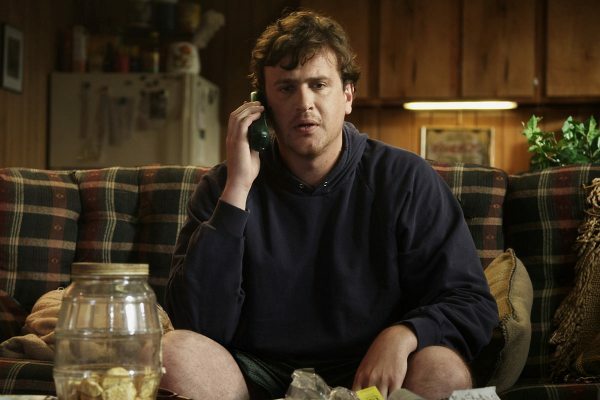 Sarah: Andrew and I really love Jason Segel! We both loved Forgetting Sarah Marshall and I Love You, Man, both of which Segel is so good in combining humor and heart. But, our love truly grew when we became hooked on How I Met Your Mother and just continued with his turn as the villain in Despicable Me. We are really looking forward to his upcoming films The Five-Year Engagement and This Is 40 (the sequel/spin-off to Knocked Up). So that's why we wanted to see this movie. Andrew, what did you think of Jeff, Who Lives at Home? A: To be honest I didn't really know what to expect going into it. I knew from the trailers and what I had read about the film that Segel played a lovable stoner (when DOESN'T he play a lovable character?) and he happened to run into his brother while out and about one day. Besides that I was going in blind. 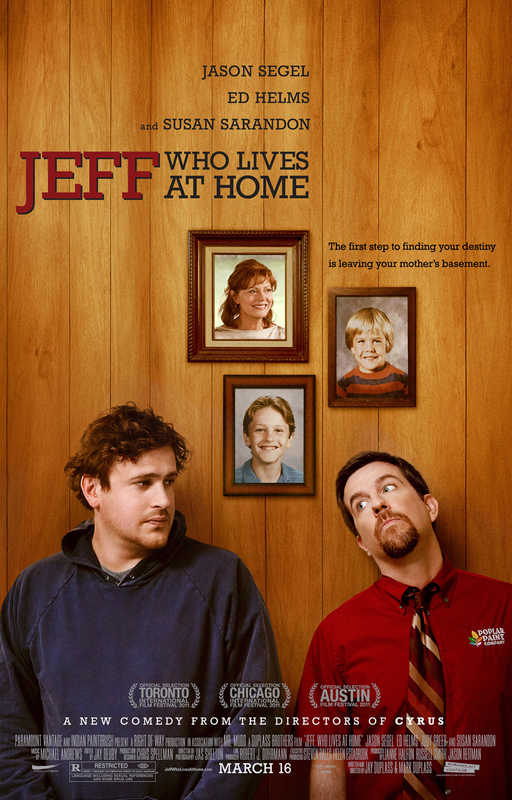 So I'm happy to say I was pleasantly surprised at how much I enjoyed Jeff, Who Lives at Home. Segel and Helms are genuinely funny guys on their own and played off each other well in this film playing brothers. They usually both play characters that are lovable or are good-natured, but I was caught off guard by how much I disliked Helms characters for most of the movie. Did you get the same vibe? S: You're right, I was a little surprised too, but I must say that the characters just seemed lost in their own ways. A major plot point is that they all still seem to be dealing with the loss of their Jeff's and Pat's father, even though it had almost been 20 years since he passed. Jeff, especially, seems to be going along with life hoping to bump into his destiny or at least follow a sign that will lead him to it. What I really liked about this movie is that it starts with literally nothing. A couple lines, a water bong and a wrong number. That's it. From there the film grows so organically that it is almost beautiful. A: I like the way you put that. It really is organic. For a film that clearly makes "destiny" or "fate" a big part of the characters' plot lines, it could have easily felt forced and I don't think it was forced at all. In fact, even though I felt that Susan Sarandon's sub-plot was pretty useless for most of the film, I like how it all tied together really neatly in the end. I wanted to point out another part of the film that I really enjoyed, and that was the camerawork. It was all hand-held and at times it could be a little shaky, but I enjoyed the times when the camera would focus in real tight on Jeff's eyes or Sarandon's face when she smiles. It was the little things I noticed about the film that maybe raised the film up from being just an okay film to a good one. S: I agree with you on Sarandon's plot and the camera work. I usually don't like the hand-held look, it's usually too shaky for my taste and up in the actors face, but this really worked for me. I also liked how there were funny parts that had me laughing for a little bit but for the most part it was kind of serious with some deep story plot points. I definitely left the movie thinking. 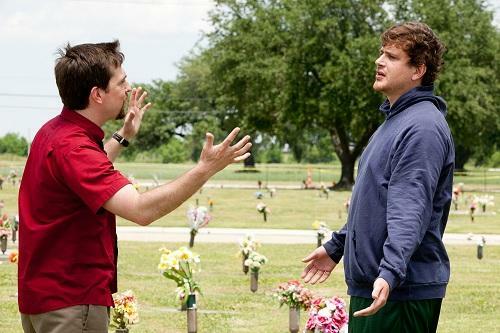 Pat and Jeff argue while visiting their father's grave. A: The script does do a good job of making the humorous parts come out of the natural progression of events, or how the characters would really react to a certain situation. That said, I think that's a great opportunity to say that the film was pretty slow at times, so if you're the kind of moviegoer who fidgets and gets restless when there's not a whole lot going on, this may not be the film for you. This movie is very deliberate in what it's showing. It's actually a pretty short film, too, but it still may linger a little long on unimportant things for some viewers. Ok Sarah, when all is said and done, what's our final verdict on Jeff, Who Lives at Home? S: While this was a nice movie to see in the theatres on a Friday evening we really think that you could Netflix it on a rainy weekend. This could have had so much more potential to be better than it already was but it had lazy writing. Everything was one big coincidence and the end was way too heavy and cheesy to make this somewhat slacker comedy reach out. Good review though. It had its moments and a good cast but it bothered me a little too much.